According to the American Diabetes Association, 8.3% of the United States population has been diagnosed with Diabetes. This does not include the additional 79 million people found to be “pre-diabetic” and likely to develop diabetes in the future. Diabetes is the leading contributing factor in mortality and other chronic health issues such as kidney disease, heart disease and stroke. Never is the expression “knowledge is power” more appropriate than when it is applied to diabetes management. The more you know about your disease, the better you can take charge of your health. We, at In Motion, are committed to providing you with the information and support you need, especially when you are first diagnosed. 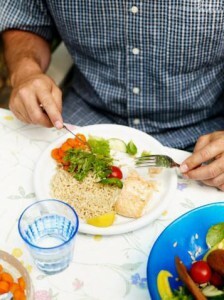 We can teach you how to utilize proper nutrition, medication and exercise to take control and understand your diabetes. Our professional staff members offer two distinct but complimentary programs to improve your health. Your physician can refer you to one or both of these programs. Health insurance often will cover the cost of these programs and we can help you determine this. A Comprehensive Nutrition Assessment – A complete hour-long nutrition and lifestyle assessment at the first appointment is followed by the development of a completely personalized nutrition care plan specific to each client’s nutritional needs and lifestyle. One-on-One Education- The dietitians review the physiology of diabetes, explain how to interpret self- blood glucose monitoring results, and educate patients about appropriate dietary adjustments. In Motion’s diabetes educators also review how to identify the symptoms of dangerously low or elevated blood glucose levels and take appropriate action for treatment. Ongoing Support – Diabetes is a chronic condition that should be managed carefully. Your dietitian will be your health advocate – helping you to stay on track for proper diabetes management and, if necessary, weight loss. Diabetes Nutrition Counseling is offered at all of the In Motion sites that offer Nutrition Services. If you would like us to see if your insurance will cover some or all of the cost of nutrition counseling, simply have your physician fax a referral for nutrition counseling to the clinic (offering nutrition) that is most convenient for you. Our staff will contact you to get your insurance information, verify coverage and schedule an appointment for you. This program offers basic training in ALL areas of diabetes self-care. This includes nutrition but also reviews medications, monitoring of blood glucose, being active, problem solving and reducing risks. This is generally provided in a group class format taught by a multi-disciplinary team. Some education can be provided via individual sessions depending on your needs and insurance stipulations. We work with our patients to set individual behavior goals for long term management of diabetes and health. Our program is recognized by the American Association of Diabetes Educators (AADE). Such accreditation ensures that our program meets and exceeds National Standards for Diabetes Self-Management Education. To register for our class series, you simply need to get a referral from your physician specifying “Diabetes Self-Management Education”. At this time, our group classes are held at our Town Center location (4677 Columbus St., Virginia Beach, VA 23462) but we hope to expand our classes to other parts of Hampton Roads. As with our nutrition referrals, we will contact you to obtain your insurance information and check on your coverage for these services. Therapy (MNT). He/She just needs to indicate both on the referral. Many insurance companies will cover the cost of both of these services for their subscribers with Diabetes. Many insurance plans cover our Registered Dietitian services with a diagnosis of diabetes and a prescription from your physician. Contact one of our locations (below) for more information on insurance coverage and pricing.